There's nothing like a small baked treat with a delicious twist to improve any occasion. I love a good lamington, and my favourite condiment is quince paste. I have put them together here for a tart twist on the Aussie classic that can be served for any occasion. Preheat the oven to 180C and line a 12-muffin tin with paper patty pans. In a separate bowl, sift the flour with the baking powder. With the mixer on low speed, alternately add the flour mixture and 120ml milk to the butter mix. Scrape down the sides of the bowl as needed. Evenly fill the patty pan cups with the batter and bake for about 18 minutes or until just set and a toothpick inserted into the centre comes out clean. Once cooled, remove paper patty pans carefully. Place the icing sugar and cocoa powder in a bowl. Heat the butter and remaining 120ml of milk in a small microwave-safe bowl until the butter is melted then pour into the icing sugar mix. Stir the mixture until it reaches a smooth pouring consistency. Place the coconut on a large plate. One at a time, dip the cupcakes into the chocolate coating then roll the cakes in the coconut. Gently transfer the lamingtons to a clean wire rack to set. Once set, use a small paring knife to cut out a teaspoon-sized hole in the top of the cake and fill with quince puree. Pipe cream on top of each cake and serve. 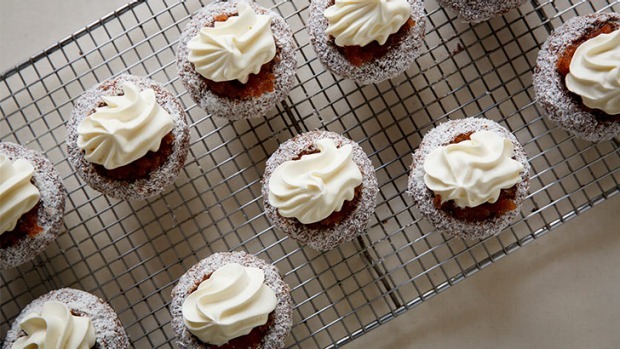 TIP: Icing the lamington cakes is easier with two people: one to dip each cake in the chocolate, the other to coat it in coconut, so you don't have to clean the icing off your hands each time.